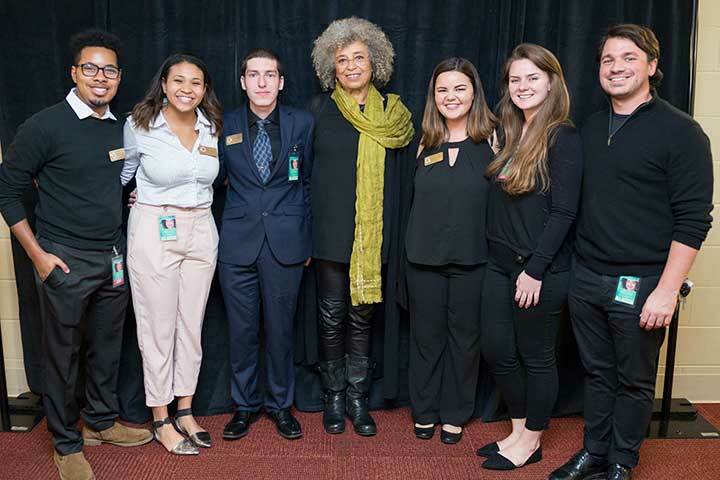 Angela Davis — author, scholar, educator and civil rights pioneer — discussed the imprint of racism on society in her keynote lecture during Florida State University’s 30th Annual MLK Week Commemorative Celebration Jan. 16 at Ruby Diamond Concert Hall. Before Davis’ talk, the FSU Gospel Choir performed and President John Thrasher offered words of welcome. The university also announced the winners of the 2018 Dr. Martin Luther King Jr. Distinguished Service Awards. The auditorium erupted in cheers and applause as Fabian Tata, assistant director of FSU’s Center for Academic Retention and Enhancement (CARE) tutoring and computer lab, accepted the distinguished service award for an FSU administrator. Joedreka Brown Speights was the faculty recipient. Brown Speights is an associate professor in the FSU College of Medicine and the associate chair of the Department of Family Medicine and Rural Health. The Dr. Martin Luther King Jr. Distinguished Service Award was established in 1986 to honor faculty members, administrators or staff members for their outstanding service in keeping with King’s principles and ideals and carries a $1,000 stipend for the recipient. Additionally, the university honored the winners of the 2018 Dr. Martin Luther King Jr. Book Stipend awards. Endowed by the Office of the Vice President for Student Affairs and the FSU National Black Alumni, the Dr. Martin Luther King, Jr. Book Stipend Award is a scholarship designed to support outstanding graduate and undergraduate students as they complete their education. This year’s scholarship recipients were Briana Edwards, a first-year graduate student majoring in higher education administration; Danisha Carrasco, a junior business marketing and management student; Francesca St. Hilaire, a sophomore studying family and child sciences; Essence Duncan, a sophomore majoring in psychology; Alinor Mezinord, a senior biology student; and Ahyanni McCray, a freshman and first-generation college student. Davis’ talk centered on four themes. She discussed an urgency to resist current political circumstances, and she encouraged people in the crowd to join her. Davis also urged them to show solidarity with Haitians and Africans as they continue to struggle for freedom. She also hoped more people would take an interest in the plight of prisoners as well as show support for the new women’s movement. Reflecting on the legacy of Martin Luther King Jr., Davis encouraged attendees to consider the contributions of all activists who stood up for justice. She said racism is deeply embedded in the structures of society and the only way to change that is with a united effort from everyone. Davis surmised that social justice movements today aren’t working to individually reap the ultimate fruits of the struggle, but rather helping forge a new path for others to continue the fight.